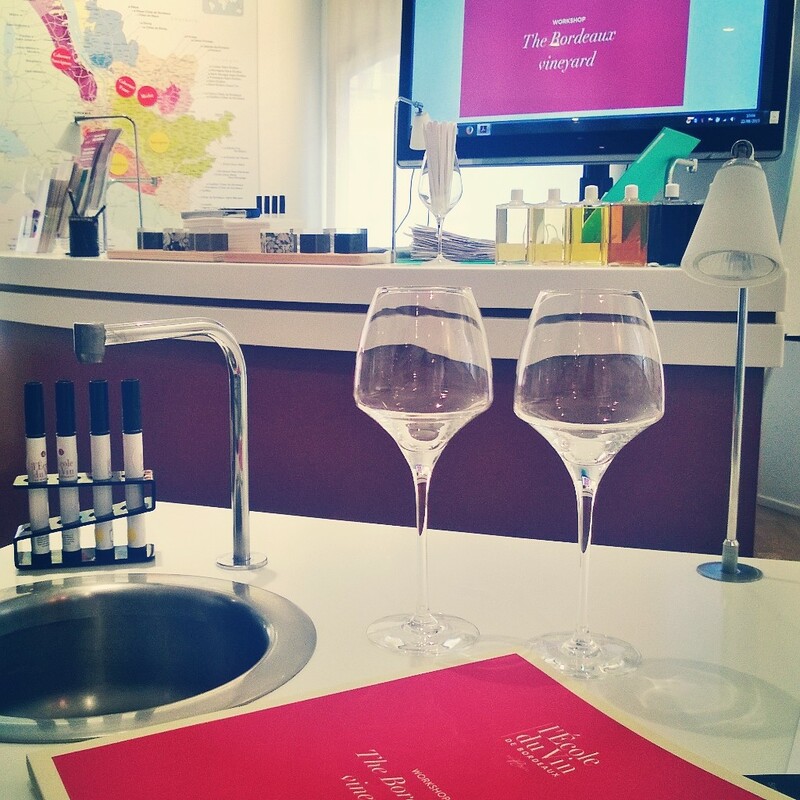 If you happened to visit Bordeaux – it is just a matter of time when you find yourself at the doors of the Bordeaux Wine School, all athrill and intrigued to enter and learn it ALL. 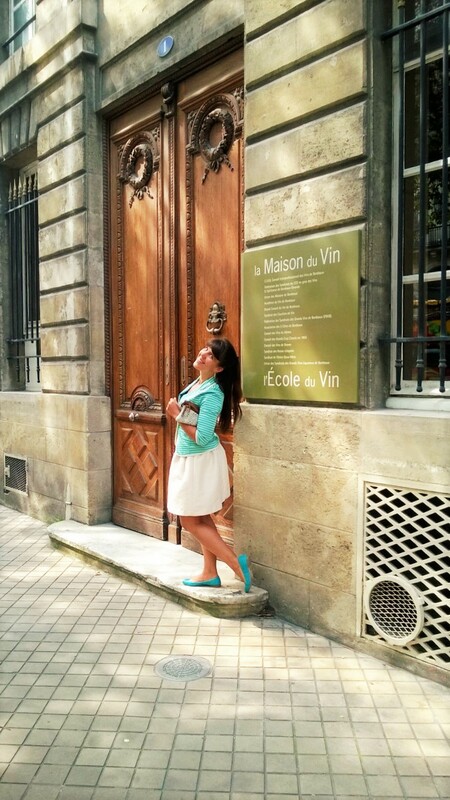 For me, the fluttering bottle-shaped butterflies on the facade of L’Ecole du Vin have been a major orienting-point during the first few weeks in the city, so, eventually, I took it as a sign to register for a wine-tasting class. The building of L’Ecole du Vin is pretty much a landmark. 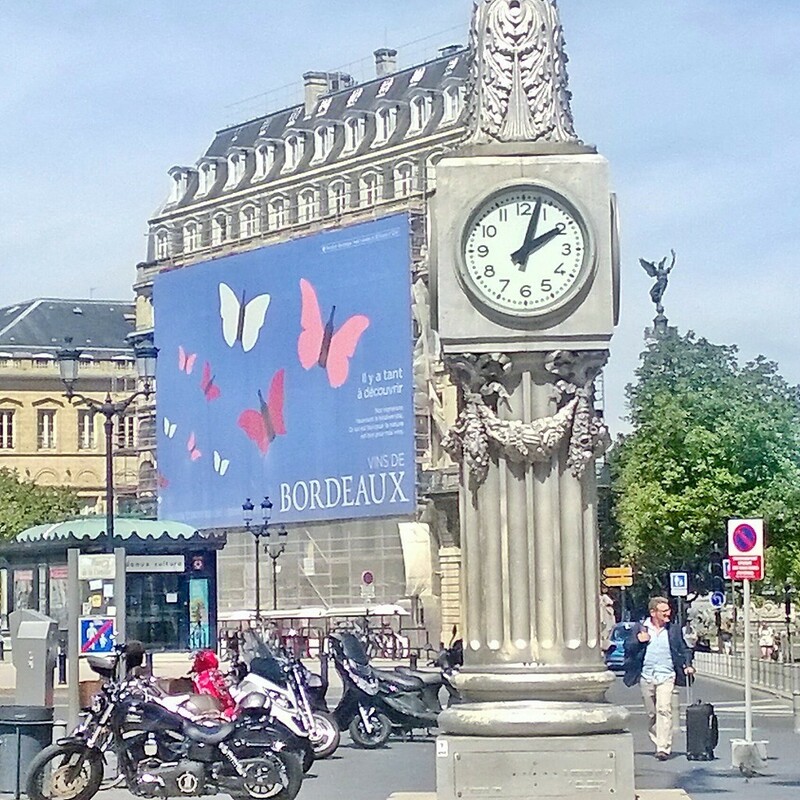 The first weeks of my Bordeaux life those bottle-shaped fluttering butterflies on its facade were my most accurate orienting point. I have to confess that at the back of my mind I was a bit afraid to fall into a newcomer’s trap (it’s like getting deep-frozen paella in Andalucía or watching “Swan Lake” without a full orchestra in Saint Petersburg – sad but still possible). But, apparently, in the beautiful soaked in wine le département de la Gironde the probability to have an unlucky wine-degustation experience is close to zero. The region does an admirable effort to raise wine-awareness and to educate the blissfully unaware consumers – just like me. What makes Bordeaux wines unique? 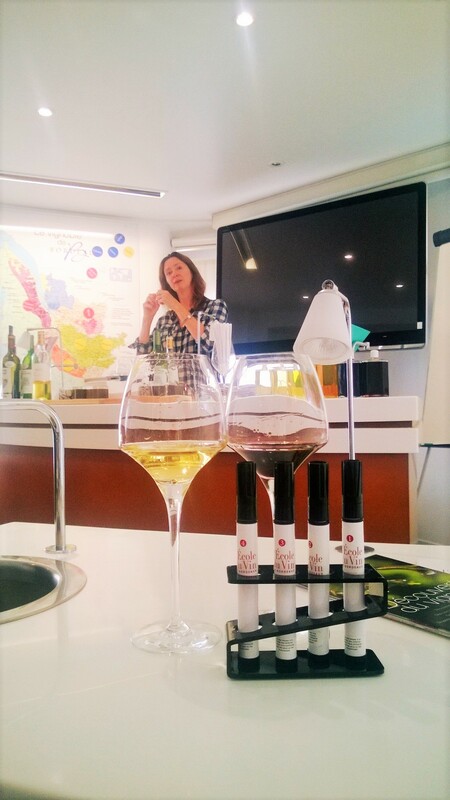 Our tutor, Jane Anson, the wine journalist from UK, had a challenging task to tell about the past and present of Bordeaux wines in 2 hours. So why on earth Bordeaux wines are internationally acclaimed, even though comprising only 1.5% from the world’s trade? Predictably, there is no one-word answer. However, the obvious is: Bordeaux wines can age and can be enjoyed years and years after purchase – in the category of long-living wines they stand almost no competition and make 80% of the market. Could it be a good idea to buy a tiny cellar and start investing? The whole lot of geographic and political factors shaped the content of our today’s glasses. Like, safe and deep port – historically ideal for trading; marriage of Eleanor of Aquitaine to Henry Plantagenet in 1152 that secured wealthy and equal partnership with England (since that time Bordeaux wines are produced with a foreign market in mind); the Dutch discovering the unusual pebble of Medoc that can reflect the sun and keep the heat. And the weather, of course, the mighty weather: the instability of the ocean climate that allows interesting blendings (like, structurally strong cabernet sauvignon with fruity merlot), or cool ocean winds that keep acidity high – this is crucial if you plan to enjoy the bottle that was corked 50-70 years ago. Seems like Bordeaux was destined to be The wine region. Beyond question, the workshop’s cream of the cream moment started when we got to do some action. First off, to identify four aromas sealed under the tightly closed tops of four pens. Jane emphasized repeatedly that there is no right or wrong answer: you sense what you sense, and rely on your very first association. She also stressed that when it comes to wine, the sense of smell is far more important than the sense of taste. Good news that it can be trained, just as muscles can. It is amazing how the perception of wine changes from your cultural background. It is amazing how the perception of wine changes from your cultural background. For example, the second sample was like a pang of nostalgia to me: freshly cut green grass, meadows, late August, and I impatiently moved to the next pen, presuming that the task was too obvious. Come on, this is how Sauvignon Blanc smells! However, my Mexican boyfriend left the space blank, as he never had any meadows in Mexico City. Same glass – different perception. Besides, I should have known better that it is never obvious or straightforward with wine and especially with Sauvignon Blanc: it contains a molecular that depending on the intensity can smell like a passion fruit, asparagus or a cat pee. Go figure its true nature. Nowadays, Bordeaux wines are exported to 150 countries (42% of the whole production is for export), so the local wine experts are actively searching for the new references: for example, in China the reference to “blueberries” might sound as obscure as “summer cottage meadow” for Mexico. Apparently, for many people, who are not experts but just wine-enthusiasts, it is important to relate to something while enjoying the drink. As for me, it certainly doubles the pleasure. 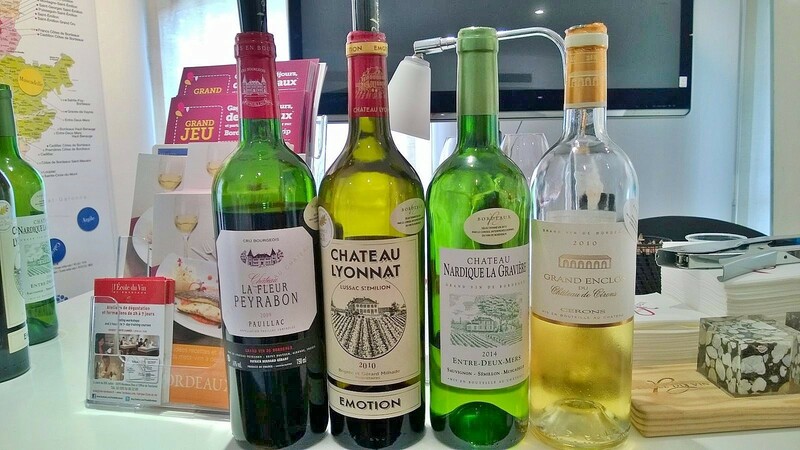 The second euphoric moment of the morning was to taste four different wines (2 reds and 2 whites) selected by L’Ecole du Vin. The evident beauty of this experience is that you get to sniff, slurp and spit out (optional!) like a pro. But not only that. After a certain amount of theoretical background you start getting a long hoped-for glimpse of consciousness while sipping. For example, you can picture the wide Garonne river and then tell to yourself: mmm…the Left bank wine tastes far more intense, kind of Alpha-wine, while the Right bank reds are smooth and Audrey Hepburn-like elegant. Is wine in your glass long? Is it deep? As Jane mentioned, nowadays, the experts do not only operate with the well-established adjectives from the wine glossary: nervy, structured, rough, lean or fresh. They also suggest to think of wine as an architectural shape, and question yourself: is it long wine? Is it deep wine? Sorry for this inevitable part: after all, I had four glasses of wine before breakfast! Probably, you also read the much talked-of article from Guardian that defined wine-tasting as a junk science and questioned: is it possible at all to tell the difference? Perhaps, the sudden public annoyance came from the fact that with so much information available it just became too easy to fake the expertise (in anything, not just in wine!). Not everybody who claims so – has the real ability to rank wine – sounds like 100% true story. But it is as well true, that there are a lot of people out there with a broader perspective, constantly working on training their senses and shaping their perception abilities. Like the chefs, perfumers or art critics, who will make no mistake to tell the brushstrokes of one artist from another. And I have a strong feeling that I am surrounded by them now. I have a strong feeling – lots of those who actually understand wine live in the region of la Gironde. 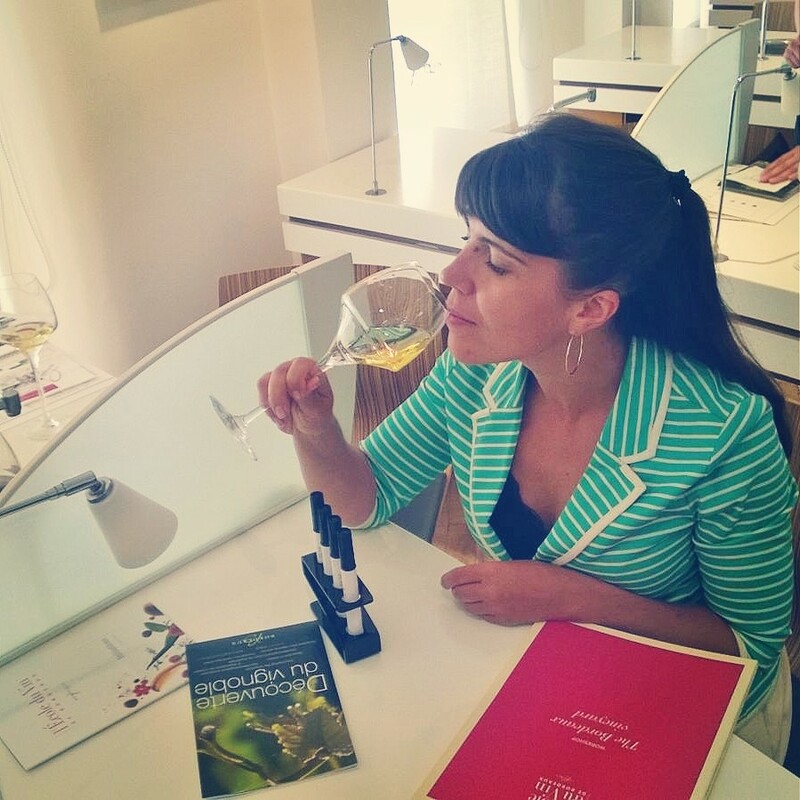 As for wine-dummies, like me, the article itself stated that within eight tastings, most people can learn to detect and find a right vocabulary to name a reasonable range of aromas in wine. That is why I was scribbling after Jane madly: even if I never be able to identify the time of the day when the grape was picked up – I can definitely enjoy the bottle from Pomerol or Pessac-Léognan with a bit more understanding of the matter. Final note to self: during the class I happened to hear the most French word combination – “glamorous wine cellar”. Love the sound and intriguing spirit of it. Next destination will be Chateaux Margaux – urgently need to see one of those. Next Post У вас все муми-тролли дома?